This week has marked a very significant birthday in Australian motorcycling. 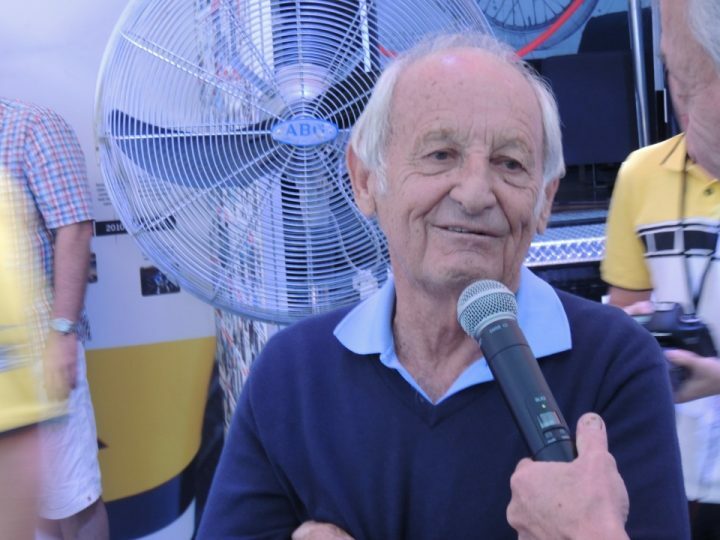 The revered former Sydneysider, Kel Carruthers, known as Mr Yamaha by those whose affection for road racing runs deep, turned 80 years old on the 3rd of January. Before he decided to explore the wide world of overseas road racing, Carruthers was the dominant force in domestic road racing. Kel’s dad ran a bike shop and Kel was getting grease under his nails before his age had reached double digits. He started racing at 12 (presumably on dirt since our local administrators have only very recently allowed children of that age racing on tar) and, by the time he left for Europe to explore the wider world of racing, he had won everything worth winning in Australia including all the road racing titles, 125cc, 250cc, 350cc and 500cc. His wins in all of the classes bar the 125’s came on the howling Honda 250cc 4 cylinder bike which could be cross-entered in all of those categories. Racing against local riders on (mostly) single cylinder British machinery, Kel was unbeatable so it was only natural that his thoughts turned to what he might be able to achieve in a more demanding arena. So, in early 1966, Kel packed up his family and moved to Europe in search of the big time. Family has always been very important to him and there are many who believe that part of the secret of his success overseas is the fact that, having his family with him on his travels prevented him from suffering the homesickness that affected many Antipodean riders who set out to race overseas. While most of Kel’s successes had been on 4 stroke machinery, he realised that, to get anywhere in Europe he needed to be on a 2 stroke machine and his first race bike over there was an Italian Aermacchi with the Italian engine being mounted in a Drixton frame. Boutique framed builders were well known in Britain at this time, specialising in taking good engines out of poor frames and allowing enthusiasts to fully explore the engine’s capabilities. It is a tribute to them that Drixton frames are still being used in Historic racing with many of the most successful Honda-based bikes in the 250cc and 350cc categories being from this manufacturer. Going from being a big fish in a small pond to a small fish in a big pond is a challenge that only the best can survive with even Kenny Roberts (of whome more shortly) struggling with this in his first European season (1978). But Kel was the real deal and he soon found himself attracting the right sort of attention. So good was he that he finished 3rd in the 250cc World Championship on a privateer bike. By the start of 1969, Kel was riding for the Aermacchi factory. However, the Italian firm was struggling and were amenable to letting Kel go when he was offered a contract with another Italian company, Benelli half way through the season. Kel repaid their confidence in spades, by clinching the 250cc World Championship for them at the final round of the season in Yugoslavia. There wasn’t much in it at the end but Kel managed to defeat Satiago Herrero and Kent Andersson, both established stars. The 250cc Benelli was a 4 cylinder 4 stroke bike and to defeat the horde of “strokers” was creditable indeed. Kel continued racing throughout the following years, riding mainly privateer Yamaha TD2’s. In 1970 he very nearly won the title as a privateer, an unheard-of thing at that stage. He set 5 fastest laps that year and won more races than his competition but was let down by mechanical unreliability, notably the fragile ignition system of the TD2. He also finished 2nd in the 350cc title race on a private TR2. By this stage he had won 7 250cc races including two wins at the Isle of Man and one at the equally unforgiving Nurburgring. He put his success down to riding fast but not too fast. Commenting on his title-clinching race at Opatia (Yugoslavia) he was quoted as saying this, “It’s one of those races where it was better to be 31 years of age than 22 years of age.” Indeed, despite his huge success, Kel was one of the safest riders ever to compete on the world stage; he never once broke a bone, was never hospitalised and never missed a race through injury, a remarkable achievement given the pig sty tracks that riders were forced to endure in the day. In 1971 Kel went to America in search of further fame and fortune. Yamaha had offered him a “works” contract and he took it. Here he found his motorcycling home. Indeed, He and his family have been American residents ever since, though never giving up their Australian passports and citizenship. In his first year in the States, Kel won more money than he had won in the previous years in Europe (and European GP’s did pay reasonable start money, it must be added.) Kel was already in his mid-30’s, had been and done and it didn’t take much arm-twisting from Yamaha for him to finish his racing career in 1972 and take on the role as Team Manager for Yamaha in the USA. 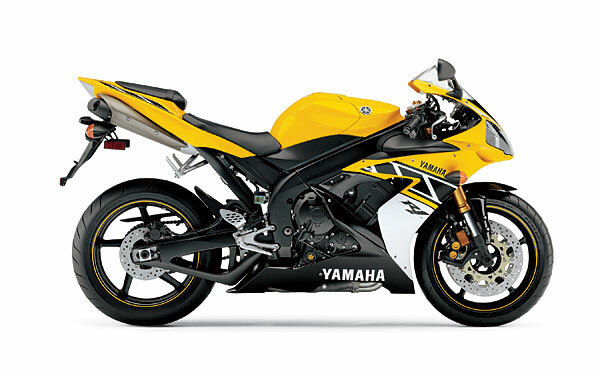 Along with the job came the responsibility of tutoring Yamaha’s rising star, Kenny Roberts. Under Kel’s tutelage, KR won the AMA #1 plate in 1973 and again in 1974. 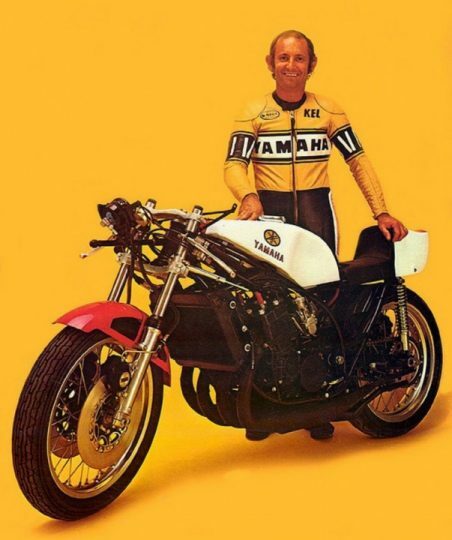 However, the multi-discipline nature of the AMA system meant that Kenny was severely disadvantaged when it came to the big dirt track events with Yamaha forced to try and make the XS650 twin a winner against the might of the Harley Davidson factory bikes that were 750cc. The HD’s were entered in huge numbers and the team and their supported riders had years of experience at the game. So the team headed for Europe, pitching the guile and expertise of Carruthers and the talent of Roberts against the established stars. Here Kel’s former experience as a GP rider came into its own. Roberts was a complete unknown and many of the European promoters were reluctant to even give him a start, let alone pay him any start money. The grids were filled with established riders on a plethora of Yamahas, why did they need another Yamaha riders, and one who they didn’t even know? What swung the balance in Kenny’s favour was that the DID know Kel. His cachet of success and his 1969 world title became the team’s bargaining tool and Kel was able to forge a path into GP racing for Roberts (AND, it must be added, to all the American stars who followed him) which Kenny may not have been able to do by himself. In 2015 I attended the Sydney Motorcycle Show. Kel was the Guest of Honour on the Yamaha stand and, amidst the media scrum I was fortunate enough to get a few words with him and, as you’d expect, they were solid gold. Kel and Kenny went to Europe in 1978 with the intention of competing in, and hopefully winning, the 500cc world title, the main crown on offer. But their brief was also to compete in the 750cc championship when its rounds didn’t conflict with the main events. Realising that Kenny would be racing on tracks that he had never seen before, Kel planned to give him the practice that he needed by also taking with them, and entering at each meeting, the team’s 250cc bike. And it was the fact that they had the presence of mind to do so that gave Kenny the edge in learning the many new tracks on which he was racing. After his first few starts, there was no question that he would be accepted (at the first GP of the season he went within an ace of not racing at all!) And Kenny’s performance on the 250 was what attracted the most attention to start with. Indeed, at Assen, he put the 250 on POLE for the Grand Prix ahead of all the established stars. By now, though, Kel realised that the job of fettling and Kenny racing two bikes each meeting (as well as his F750 commitments) were getting to be too much and Kel withdrew the 250 from the race and, from then on, they just concentrated on the 500. After a torrid season of learning tracks, enduring the xenophobia of the European organisers and brawling with the reigning 500cc champion, Britain’s Barry Sheene, Kenny won the 500cc title on debut, raising Yamaha’s stakes and they backed it up by repeating the dose in 1979 and 1980, a three-peat for a rider who had barely been heard of before. Years on the job (and on the road) started to take their toll and Kel “retired” to California (where else?) and spent his time in consultancy work, He maintained (and continues to maintain) strong ties to Yamaha and every time you see the familiar black and yellow colour scheme you are seeing the tangible reminder of Kel’s years as Yamaha’s #1 “go to” man. Yamaha showed their thanks in the most tangible was possible, recongnising and marking their 50 years in grand prix racing by releasing the 50th Anniversary Yamaha R1, NOT in the traditional red and white colour scheme of their original grand prix era, but in the Kel Carruthers colour scheme.. In retirement Kel has been showered with accolades and deservedly so. He remains quiet, affable and willing to answer questions about racing and is one of the most recognisable Australians in the history of motorcycle road racing.